One of the more challenging aspects of the Paleo lifestyle is making good choices on the road. Today I drove 300 miles, and picked up dinner along the way. 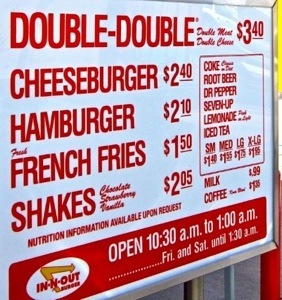 Did you know In-N-Out has a secret menu? Check it out on their website here. no spread – nothing instead. What that got me: lettuce wrapped sandwich with two beef patties, grilled onions, lettuce and tomato. You could order it as a triple or a even bigger! This is one of my go-to on-the-go staples. So good!